Schoolchildren have joined in protest to call for an end to funding cuts for Sheffield schools. Over 300 pupils from Watercliffe Meadow Primary School gathered outside Sheffield Town Hall on Monday carrying placards adorned with slogans which called on the Government to listen and make a change when it comes to the school funding crisis. They were joined by dozens of parents who offered their support by marching on the city centre with Year 5 and Year 6 students in a bid to raise awareness for the issues faced by not only Sheffield schools but others up and down the country. Jessica Lonsdale attended the protest with her children, Watercliffe pupils Michael Owen, nine and seven-year-old Rosie Owen. She said: “Kids are our future, they are going to build this city. The funding cuts are not fair. If you cut their funding then what are they going to do. I want my kids to be the best they can be – have the best job, encourage other people, be friendly – all those things they learn from school. “We need everything we can to help these kids grow and learn. They’re absolutely fantastic, they just need that push and that extra support. Olivia Blake, Deputy Leader of Sheffield Council, called the fact that schools are being forced to axe staff in order to save money a 'disgrace’ when she addressed crowds at Peace Gardens. Councillor Jayne Dunn, cabinet member for education and skills, then gave a speech aimed at the children in which she spoke of the need for funding to help schools provide the tools to help the youngsters fulfil their dreams. Crowds also heard from Year 2 pupil Malak who read out her letter addressed to Education Secretary Damian Hinds MP. She said: “I am furious because our school does not have enough money. We can’t afford to pay for all our teachers and our teaching assistants and some are losing their jobs. 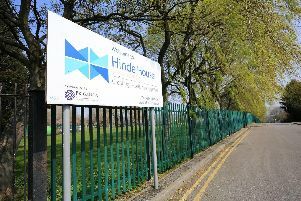 The action comes after Ian Read, headteacher of Watercliffe Meadow Primary School in Norwood, revealed he has been forced to get rid of staff to save £125,000 over the next two years. He has written a letter to the Education Secretary calling on him to avert the ‘education crisis’. Mr Read said: “Obviously I had to tell the parents why we were losing seven staff members and they wanted to do something and when you tell the kids they just think it is wrong we’re losing people that they know and have taught them or that they see everyday. Mr Read will head to Parliament tomorrow, March 19, along with over a dozen headteachers and school leaders to lobby MPs for a better deal on funding for the city's students. They will meet with Education Minister Nadhim Zahawi and deliver letters to Downing Street from children, parents and other headteachers detailing their concerns. Last year The Star launched a campaign calling for better funding for schools. Over 8,000 have signed so far, to add your signature click here.